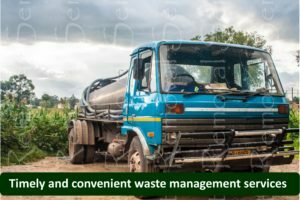 Honeysucker Harare – Waste Removal Services has efficient and EMA compliant honey suckers for all your septic tank emtying requirements in Harare and Zimbabwe. They are manned and driven by a courteous crew that will go to great lengths in making sure your septic tank is taken care off in the most safe way possible. We can meet all your requirements using these honey suckers Harare. Most have capacity that is over 8000 litres. The size is therefore enough to take care of your waste requirments, whether they be domestic or industrial. We can travel in the most rugid of terrians, meaning that we can access even hard to reach areas. These vehicles are also equipped with enough pipes and infrastructure to access even difficult areas to reach on your property. As our client, you can enjoy many benefits from using our honey suckers in Harare. As highlighted above, they can take any load reaching 8000 litres. That is your for your added convinience if you have quite a bigger tank. Do not hesitate thinking you have a bigger tank that our vehicles cannot tackle. We are there for you and your quantity. Call us today on 0772593344 and lets take that load from your shoulders away.